IT HAS BEEN TESTED AND WORKS. THERE IS A KEY INCLUDED. IT IS IN GOOD SHAPE. Very good condition. Key is in the case. Never before used, still in original box. IT IS PRE-OWNED BUT IN GREAT CONDITION. 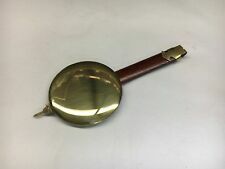 I GOT IT AT AN ESTATE SALE. THE CLOCK WORKS PERFECTLY ONCE IT IS WOUND UP WITH IT'S OWN KEY. THIS IS A GREAT DEAL FOR THE PRICE! DON'T MISS OUT ON IT! The finials are missing. Original key is included. Marked on the dial Verichron USA Huge 11" Dial All Wood Cabinet with 2 Hinged doors.…. Great clock.…. SAUWON 31 DAY KOREAN CLOCK MOVEMENT, HANDS, CHIME RODS - RUNNING, STRIKING. The movement needs to be cleaned. Condition is Used. Slight nick on front bottom,see last photo. Clock case is in nice condition. Being sold As Is. Item (s) SOLD AS IS. If there is a problem. We will happily work with you. This beautiful clock was in my office for almost 12 years. I have no problem with it. DORSET 31 DAYS Wall Pendulum Clock 31 Day Vintage Wind Up Item is in great condition. GENTLY USED. Key is missing. This is a beautiful clock that works properly. In fact it won't stop running for pictures! It has a silver dial and a gold bell on top. The clock winds with a key which is included. The top, bottom and back of the clock is a laminate wood with a handle on top to lift if needed. Linden 31 Day Wall Clock. Condition is Used but in great condition. Shipped with USPS Priority Mail. Very clean almost new condition. Works great and has the key! 31 day chyme. This is a very nice Pol Aris wall clock. It is black wood with gold trim. There is etch work on the glass that is of peacocks. On either side of the clock is pillars with squares and flowers as you go up the clock. Strausbourg Manor. condition as originally sold. be prior to buying. Linden 31 Day Wall Clock, Model #8052, w/ key works and chimes made in japan. Condition is Used. Shipped with USPS Parcel Select Ground. This is contemporary Vienna-style wall clock with a 31 day movement. The clock has been running and chiming without issue. It may require professional setup and adjustment after shipping. This is a nice looking clock with no reportable flaws. The case is finished in distressed oak and looks really mice. It’s priced sell so don’t miss it. As with any mechanical clock, this one will require professional set up and/or adjustment after shipment. Accuracy is rarely tested and maintenance records are unknown unless otherwise specified. No guarantees or refunds are offered or implied. That being said, I will insure all packages over $100 and do my best to assist with set up if necessary. You can message or call. If you do not agree to these terms please do not purchase. Up for sale is this Modern quarts R & A 31 Day Wall Clock. Measures 35” x 7” x 14” . Made In Korea. Clock Works Perfectly, but chime is just for show. Adornment in top right corner is missing the tip, see pictures. Runs on one C battery. Fast shipping! This clock has just recently been completed serviced and cleaned. It is easy to set in beat and can run for a week after winding. The spring that drives the chime hammer is broken but the rest of the movement works perfectly. The spring can be replaced easily by taking the movement out of the case. Please message me with any questions or concerns. INVENTORY LOCATION: FRONT. If you have a problem with your item or feel that you can not provide. Our goal is to provide you with a Superior Product and Excellent Service. OFFICE SHELF. 11 1/8" WIDE. Key provided. Case has a few scuffs and the latch is loose, but included. With Pendulum & Key. Hour & Minute Hands are in Place; Pendulum in Place with Key. Face of the Clock is about 8 3/4" and Covered with Glass. nice clock.…. see pictures. Reverse paint on small glass door. I PUT TAPE ON IT TO HOLD IT. GLASS IS CRACKED ON THE BOTTOM. INVENTORY LOCATION: FRONT. If you have a problem with your item or feel that you can not provide. Very good condition, however it is missing a finial that would go into the cornice from the top, which can be removed easily. Key is in the case. This is a very nice clock. The glass is perfect, 6 enclosed by glass door shelves. All around very nice. I have had it hanging and running for a while now. I was going to hang on to this one myself but I would rather keep the grandfather I was able to get. In very good shape. Wood shows little to no signs of wear. 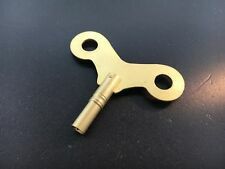 Power Source : Wind up key (key is included). -Style : School House. -Material: Oak wood case. Light dusting may be needed. Light scratches & nicks. Check all photos closely for your final approval. Beautiful wood cabinet. This clock was running while photos were taken! Dark wood finish. 31 Day Ronell Regulator Battery operated wall clock with working pendulum. Battery operated. Very solid with no Nick's or scratches. Welby 31 Day Vintage Regulator Wall Clock Chimes Pendulum & Key 26" x 14" x 5"
Needs to be cleaned and oiled. See pictures for details. See the scuffs recieved in a recent move. This clock is beautiful and sounds amazing. I have used it for a while and now am getting a bigger clock. The key comes with it. Vintage Le Gant 31-Day CHIME WALL CLOCK & KEY ~ WORKS! !